Kelly Thomasson has served in the McAuliffe administration since 2014 and was sworn in as the Secretary of the Commonwealth in April 2016. Before joining Governor McAuliffe’s administration, Kelly worked for Senator Mark Warner for 13 years in various capacities, including Projects Director in his U.S. Senate office and Director of Scheduling in the Office of the Governor. A native of Richmond, Kelly received her Bachelor of Arts degree from Virginia Commonwealth University. She is involved in many local community activities, including serving on the board of the Ashland Main Street Association. Kelly also serves on the Lead Virginia Board of Directors and was appointed by Governor McAuliffe to serve on the Virginia Information Technology Advisory Council. She is a graduate of Lead Virginia and was named Top 40 Under 40 by Style Weekly in 2017. Traci DeShazor will continue in her role as Deputy Secretary of the Commonwealth. She was appointed to this role by Governor Terry McAuliffe in June of 2016. Prior to that, Traci served as Deputy Director of the Virginia Office of Intergovernmental Affairs for Governor McAuliffe and as the African American Outreach Coordinator for McAuliffe for Governor. A native of Danville, Virginia, Traci received her Bachelor’s degree in International Studies from Virginia Tech and her Master’s degree in Justice and Legal Studies from Hollins University. Additionally, Traci is a proud graduate of the Virginia Executive Institute and the Sorensen Institute for Political Leadership. Keyanna Conner currently serves as State Director for U.S. Sen. Mark R. Warner. Previously, she served as Senator Warner’s Director of Government and Community Affairs, where she was the primary point of contact between the Senator’s office and representatives of state and local governments, public agencies and constituency organizations. Prior to joining Sen. Warner’s official Senate staff, Keyanna was a senior advisor on Senator Warner’s 2014 re-election campaign. Conner received her undergraduate degree in chemistry at Hampton University, and her doctoral degree in organic chemistry at Virginia Commonwealth University. She grew up on the Eastern Shore of Virginia. 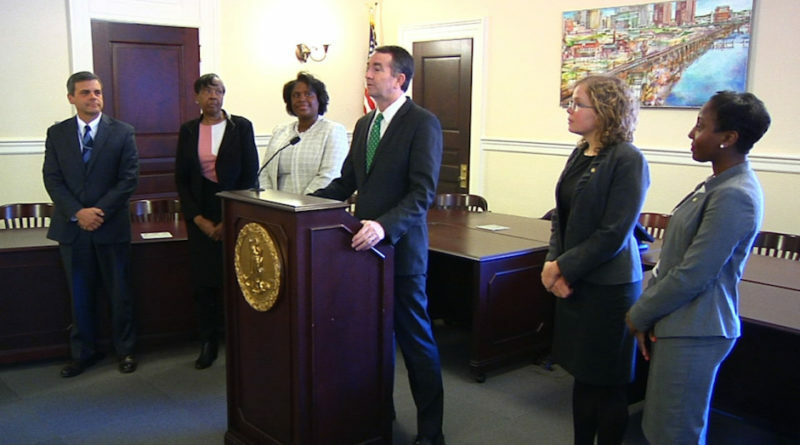 Grindly Johnson was appointed as Virginia’s Deputy Secretary of Transportation by Governor Terry McAuliffe in 2014. She previously served as Chief of Administration for the Virginia Department of Transportation – the third largest transportation agency in the nation – where she directed the divisions of Communications, Civil Rights, Human Resources and Training, Administrative Services and Safety and Performance Management. Prior to that, Grindly served as the agency’s Chief of Equal Business and Employee Opportunity, as well as in a number of private sector positions as an accountant, financial analyst and community relations consultant. In 2015, Grindly was directed by Gov. McAuliffe to lead Toll Relief, the first program of its kind in the nation that provides much-needed financial assistance to residents most impacted by tolls. Johnson earned a Bachelor’s of Science in Accounting from Norfolk State University. Joe Damico has served as Deputy Director of General Services since 2002, where he has advanced the agency’s service support to public bodies, businesses, and citizens of the Commonwealth in a wide array of services. In addition, he has been involved in historic building renovation, new construction, and maintenance and operation of executive buildings and grounds at Capitol Square. He earned a Bachelor’s of Mathematics/Computer Science from Longwood College. Joe has also earned a Master’s of Health Administration and Master’s of Public Administration from Virginia Commonwealth University.